The popliteal artery is a continuation of the femoral artery in the popliteal fossa at the rear of the knee. It begins where the femoral artery emerges from an opening (adductor hiatus) in the tendon of the adductor magnus muscle and ends where it splits into the anterior and posterior tibial arteries. As it passes through the popliteal fossa, it gives off anastomoses called genicular arteries that supply the knee joint. The popliteal fossa (Figure 2) is a diamond-shaped depression formed between the hamstrings and gastrocnemius muscle posterior to the knee. The inferior margins of the diamond are formed by the medial and lateral heads of the gastrocnemius muscle. The superior margins are formed laterally by the biceps femoris muscle and medially by the semimembranosus and semitendinosus muscles. The tendons of the biceps femoris muscle and the semitendinosus muscle are palpable and often visible. 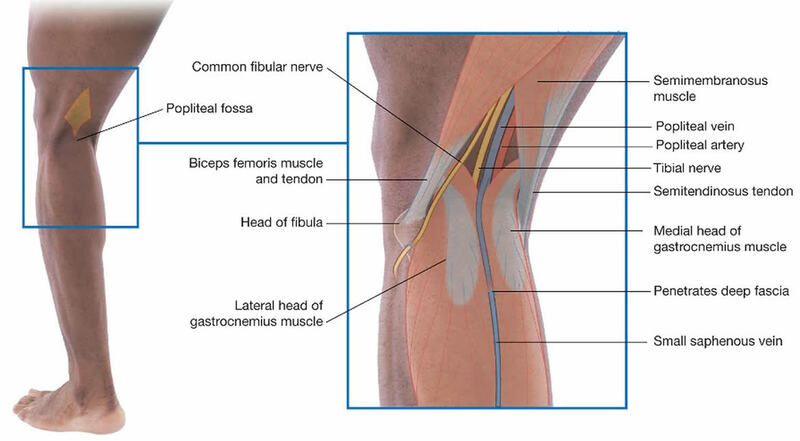 The popliteal fossa contains the popliteal artery, the popliteal vein, the tibial nerve, and the common fibular nerve (Figure 2). The popliteal artery is the deepest of the structures in the fossa and descends through the region from the upper medial side. As a consequence of its position, the popliteal artery pulse is difficult to find, but usually can be detected on deep palpation just medial to the midline of the fossa. In the leg proper, the three most significant arteries are the anterior tibial, posterior tibial, and fibular arteries. The anterior tibial artery arises from the popliteal artery and immediately penetrates through the interosseous membrane of the leg to the anterior compartment. There, it travels lateral to the tibia and supplies the extensor muscles. Upon reaching the ankle, it gives rise to the following dorsal arteries of the foot. a. The dorsal pedal artery traverses the ankle and upper medial surface of the foot and gives rise to the arcuate artery. b. The arcuate artery sweeps across the foot from medial to lateral and gives rise to vessels that supply the toes. a. The medial and lateral plantar arteries originate by branching of the posterior tibial artery at the ankle. The medial plantar artery supplies mainly the great toe. The lateral plantar artery sweeps across the sole of the foot and becomes the deep plantar arch. b. The deep plantar arch gives off another set of arteries to the toes. The fibular (peroneal) artery arises from the proximal end of the posterior tibial artery near the knee. It descends through the lateral side of the posterior compartment, supplying lateral muscles of the leg along the way, and ends in a network of arteries in the heel. An aneurysm is an abnormal widening or ballooning of a part of an artery due to weakness in the wall of the blood vessel. Popliteal aneurysms are defined as localised dilatations of the popliteal artery greater than 2 cm in diameter or an increase of 1.5 times the normal arterial calibre 1), 2). Popliteal aneurysms are the commonest peripheral artery aneurysm and have a prevalence of about 1% in men aged 65–80 years 3). They are uncommon in women. True aneurysms are mainly atherosclerotic in origin. Rare causes include mycotic aneurysm, Bechet’s and Marfan’s syndrome. The aneurysms may be single or multiple at any point along the popliteal artery. They are often associated with other aneurysms, e.g. abdominal aortic aneurysm (AAA) or contralateral popliteal aneurysms. They tend to occur in older men with significant co-morbidity. This needs to be borne in mind when planning treatment. Asymptomatic popliteal aneurysms develop symptoms at a rate of about 14% per year (range, 5–24%) 4). Acute ischaemia occurs in about one-third of cases 5), 6), 7). This is usually due to thrombosis but thrombus from the aneurysm can embolise distally. About a quarter of popliteal aneurysms are associated with intermittent claudication, either from thrombosis, repeated micro-emboli or combined stenotic arterial disease. Pressure symptoms from large popliteal aneurysms can produce pain or discomfort behind the knee or swelling, with or without deep venous thrombosis, due to popliteal vein compression in about 5% of cases. Rupture nowadays is very rare 8). Death and limb loss are both reported following elective popliteal aneurysms repair and about 1 % of patients will be left with residual symptoms 9). Five-year limb salvage and graft patency are about 90% and 80%, respectively. Despite this, approximately 25–50% of popliteal aneurysms which undergo operation are asymptomatic 10), 11), 12). The larger the popliteal aneurysm, the more likely it is to contain thrombus within it 13). One study has shown a greater risk of complications developing in those popliteal aneurysms associated with absent distal pulses 14). It is postulated that embolisation from the aneurysm can gradually occlude runoff. In a cohort of 24 popliteal aneurysms undergoing serial ultrasound scans, rate of growth increased with size and presence of hypertension 15). The expansion of popliteal aneurysms less than 2 cm in diameter was 3 mm. Were 2 cm to be chosen as a cut-off point for consideration of operation then popliteal aneurysms less than 17 mm should undergo annual ultrasound scan and larger ones 6-monthly scans. Similarly, if 3 cm is the chosen cut off point then annual scans would be required for popliteal aneurysms less than 2.4 cm in diameter and 6-monthly scans if the aneurysm were larger. The results of this study 16) show that asymptomatic popliteal aneurysms less than 3 cm in diameter with distortion of less than 45° can be safely managed by ultrasound surveillance. Bypass, preferably using vein with proximal and distal ligation of the popliteal aneurysm is the operation of choice and provides 5-year patency of 70–90% with good exclusion of the aneurysm. However, endovascular procedures may be appropriate in some cases. Whether this form of treatment stands the test of time remains to be seen. Patients with acute ischaemia due to thrombosis of popliteal aneurysms should be immediately treated with intravenous heparin and, following assessment, undergo operation, if appropriate. In addition to the recognised complications of thrombolysis, acute deterioration during treatment seems to be a particular problem when dealing with popliteal aneurysms. Thrombolysis should be restricted to attempted clearance of run-off on-table carried out whilst the upper anastomosis is being performed. Popliteal artery entrapment syndrome was first described by a Scottish medical student, T.P. Anderson Stuart in 1879 17). He noticed that the popliteal artery was passing medial to the medial head of the gastrocnemius muscle while examining an amputated gangrenous leg, but it was not until 1965 that ‘Love and Whelan’ coined the term ‘popliteal artery entrapment syndrome’. PAES typically affects both active and sedentary people, without any risk factors for atherosclerotic disease. The precise incidence is unknown but military and civilian studies report the figure between 0.165% and 3.5%. It is found most commonly in males (M:F 9:1) and 34% of cases are bilateral 18), 19). Popliteal artery entrapment syndrome is a rare abnormality of the anatomical relationship between the popliteal artery and adjacent muscles or fibrous bands in the popliteal fossa. Popliteal artery entrapment syndrome is due to either an acquired or a congenital abnormality 20). The acquired form of popliteal artery entrapment syndrome is caused by hypertrophy of the musculature surrounding the popliteal artery and this is found typically in athletes and military personnel. The congenital form occurs due to anatomical developmental abnormalities during the embryological development of the lower limb. The popliteal artery normally passes between the two heads of the gastrocnemius muscle in the lower leg. Therefore an anatomical developmental abnormality or hypertrophy of muscular tissue following development will result in a band of tissue crossing over the artery and this leads to the intermittent claudication of the artery. This band may be fascia-like or tendinous in nature. The classification system used for popliteal artery entrapment syndrome was introduced by Delaney and Gonzales in 1971 and types V and VI were added on at a later stage 21). Type I, is the classical presentation with the popliteal artery passing medial to the medial head of gastrocnemius. This results in marked medial deviation of the popliteal artery both anatomically and on angiogram. Occlusion of the artery by plantar flexion is an important sign in type I. Type II, the artery is medial to the medial head of gastrocnemius which is abnormally displaced. Type III entrapment, is caused by the presence of an additional slip of gastrocnemius muscle originating from the lateral or medial femoral condyles. Compression of the popliteal artery occurs if the artery passes anterior to the additional head of gastrocnemius. Type IV entrapment is caused by the development of the popliteus muscle over the popliteal artery. Type V results from external compression of both the popliteal vein and artery. Type VI is a functional/acquired type which results from muscle hypertrophy found most commonly in athletes and military personnel. The classification has a greater role in the understanding of the condition than in the management. When clinically examining the patient, it is important to monitor peripheral pulses (dorsalis pedis and posterior tibial) in response to active plantar flexion and passive dorsi-flexion of the foot. Diminished peripheral pulses in response to this test (Positional Stress Test), is a characteristic sign of popliteal artery entrapment syndrome but this is not reliable. Other associated signs include pallor, pain, paraesthesia (sensation of pins and needles), poikilothermy (cool lower limb to touch) and paralysis. The pain, similar to intermittent claudication, may be reported after a short, gentle walk but not while running or resting as the soleus muscle is more active than the gastrocnemius muscles while running, but this is an unreliable symptom. Radiological imaging studies are very useful when combined with positional manoeuvres. Duplex Doppler imaging is the first line study of choice 22). Angiography is the traditional method of second line investigation. It is useful in ruling out differential diagnoses such as popliteal aneurysms, adventitial cystic disease and emboli which present with similar clinical findings. The disadvantage of angiography is that it is invasive and furthermore it fails to clearly identify surrounding structures. Computed tomography (CT scan), with or without 3-dimensional reconstruction, is also reported as being useful for diagnosing popliteal artery entrapment syndrome in the literature. It provides detailed information on the wall and diameter of the artery and relation of the artery to adjacent structures but it too uses contrast material and ionizing radiation 23):477–483. https://www.ncbi.nlm.nih.gov/pubmed/9114108)). MRI and MR angiography have emerged as promising imaging modalities for the diagnosis of popliteal artery entrapment syndrome, and have the advantage of multiplanar capabilities, nonionizing radiation, high soft-tissue contrast and avoidance of iodinated contrast material. They can be undertaken at rest and during active manoeuvres, and thus show functional entrapment if present. Magnetic resonance imaging is reported as the diagnostic method of choice when there is clinical evidence or duplex Doppler imaging suggestive of popliteal artery entrapment syndrome 24). Recurrent external compression of the popliteal artery leads to mechanical damage to the vessel wall. This damage occurs in three distinct histological stages 25). In the earliest stage, the areas distal to the occlusion show neovascularization of the adventitia progressing to include the outer half of the media of the artery. There is little fibrosis or destruction of the media. In stage 2, as the disease progresses, there is much more neovascularization which spreads to include the entire media. There is fibrous replacement of the media and focal fragmentation of the internal elastic lamina. Extensive fibrous replacement of the media, marked fragmentation of the internal elastic lamina and extensive fibrointimal proliferation with overlying thrombi characterize stage 3. The development of collateral vessels may occur with these chronic changes. Therefore early diagnosis is essential to avoid these chronic intravascular changes. The early diagnosis in this case study resulted in little mechanical damage to the vessel wall. When the diagnosis is not made until the patient has reached stage 3 in the mechanical damage to the vessel wall, vascular reconstruction is required. The aim of treatment of popliteal artery entrapment syndrome is to release the entrapped artery by myectomy and to re-establish transluminal flow by repairing the luminal stenosis. If the trans-luminal flow is unable to be re-established then a venous graft may be utilized instead. It has been reported that transluminal angioplasty is ineffective, as the extraluminal aetiology will result in restenosis of the artery upon active plantar flexion 26):336–340. https://www.ncbi.nlm.nih.gov/pubmed/8681723)). The long term prognosis following release of the entrapped artery has not been extensively reported in the literature to date. Marzo et al. looked at the 30 cases of popliteal artery entrapment syndrome over a 26 year period and found that patients who needed to have popliteal artery release were younger (mean 31 years, ±3 years) than patients who required vascular reconstruction (mean 41 years, ±4 years). These patients were diagnosed at an earlier stage and therefore as a result had a better outcome (94.4% long-term patency rate) as vascular reconstruction was associated with shorter long term patency rates (long-term patency rate was only 58.3%) 27):59–64. https://www.ncbi.nlm.nih.gov/pubmed/2009987)), 28). 21. ↵ De Almeida M.J., Winston B.Y., De Melo N.R. Popliteal artery entrapment syndrome. J Vasc Br. 2003;2(3):210–218. 25. ↵ Nayler S.J., Levien L.J., Cooper K. Histopatholgic features of the popliteal artery entrapment syndrome. Vasc Endovascular Surg. 2000;34(6):665–672.